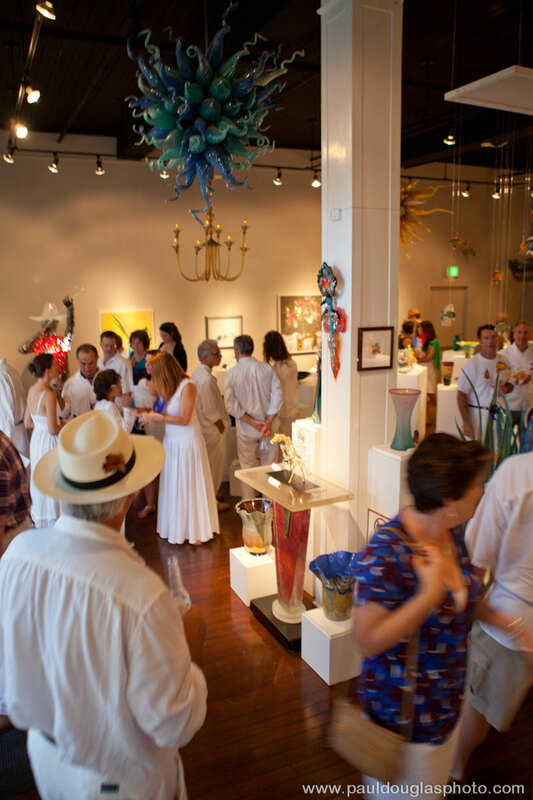 Join the New Orleans Glassworks & Printmaking Studio Saturday, August 1st, 2015, from 6:00 pm to 9:00 pm, for our annual midsummer gallery exhibition, complemented by live dragon ice-carving, and hands-on studio demonstrations by our stable of master-artisans. As with every year, this first Saturday in August marks the beginning of New Orleans's art season! 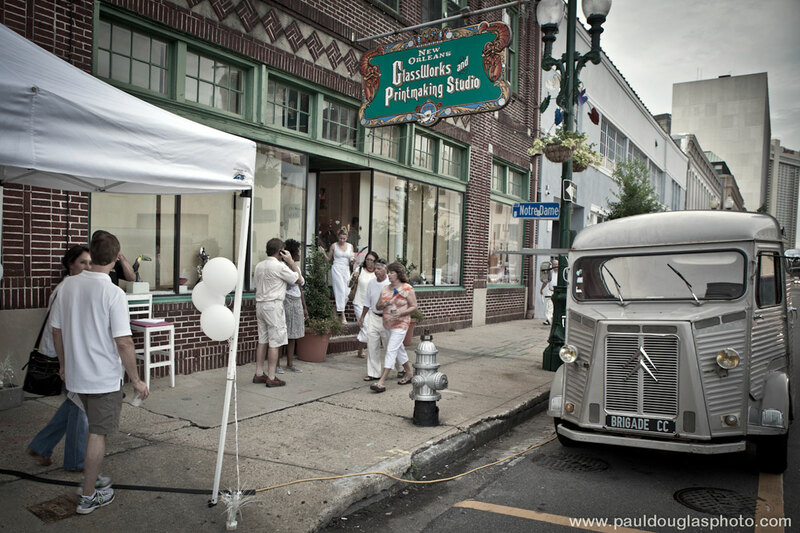 In tandem with White Linen Night, the New Orleans Glassworks & Printmaking Studio opens its doors to visitors. No cover/admission fee! All activities and demonstrations free-of-charge! Visitors migrate between our open-working studios. 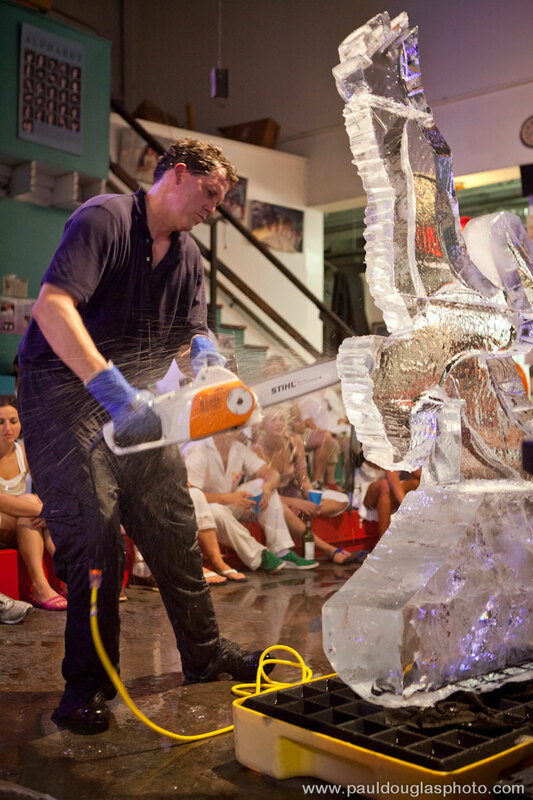 Award-winning ice sculptor Dawson List, of Ice Dragon Ice Sculptures, will cut through August's sweltering heat with his arctic chainsaw, fashioning from refrigerator-sized ice blocks wintry crystalline wonders. 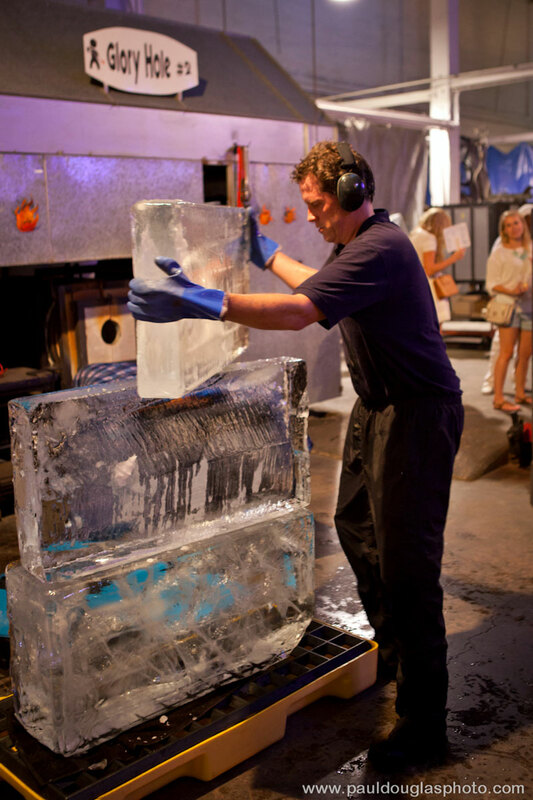 Once a year, our glassblowing arena—crucible to 800 pounds of molten glass—freezes over. Sourcing from fjords in the far-reaches of Scandinavia,1 Dawson unveils a glassy monolith, and sunders through stacked slabs of ice, from his chainsaw precipitating glistering clouds of mist and spray. This will be the spot to cool the midsummer's heat. This is where the action will be. Dawson's live sculpture is not for the faint of heart. 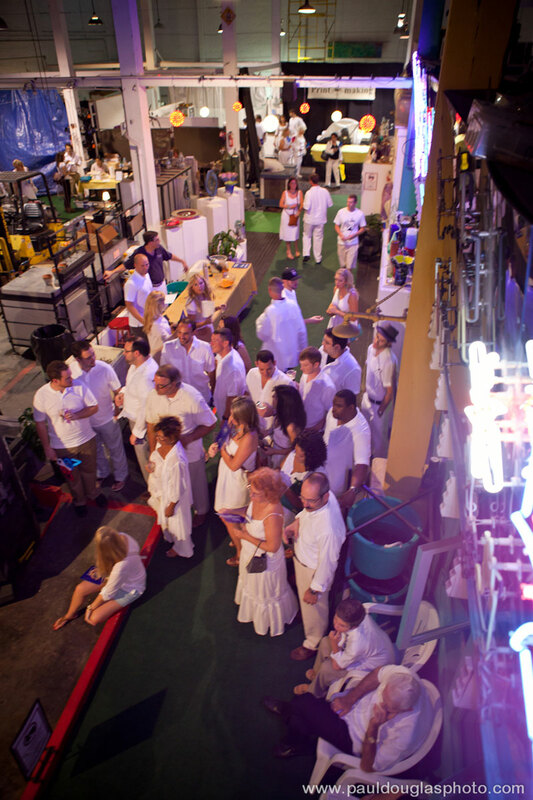 This Midsummer's White Linen Night marks his fifth year performing for our visitors. 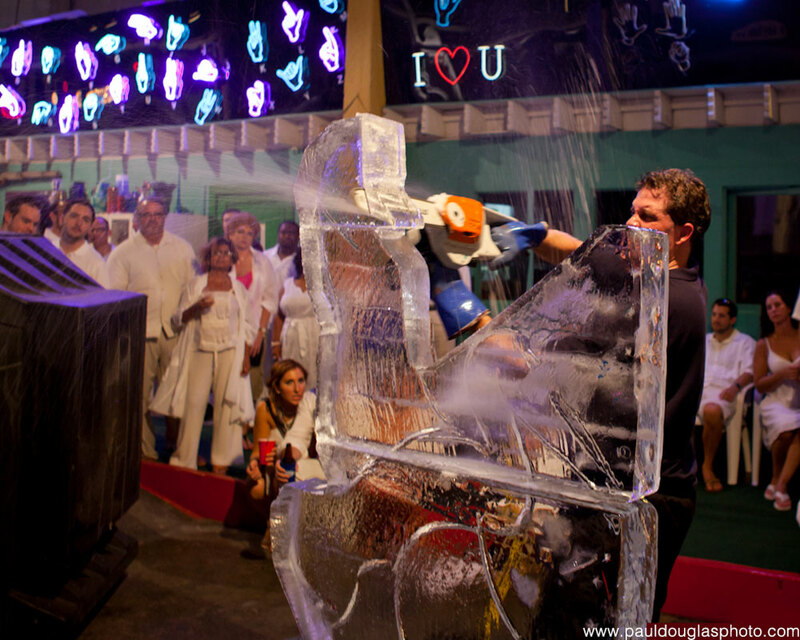 Ice sculptor Dawson List prepares his stack. Refining with Stihl: an ice pelican! 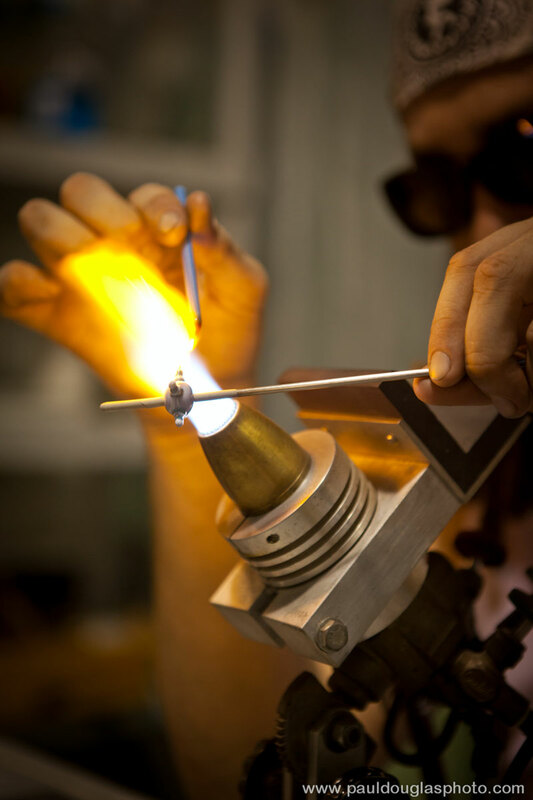 All visitors are invited to participate in free hands-on demonstrations, provided by master-artisans in our open-working studios for glass torchworking and printmaking. Torchworking instructor manipulating molten glass bead. The hard work invested by young adults of our Summer Arts Workshop culminates in a student exhibition, debuting concurrent with the event. Selected student creations in glass, clay, print, and metal shall be showcased alongside the work of our educational faculty, a stable of master-artisans and craftsmen who are renowned specialists commanding presence and influence in their respective fields, whether glassblowing, ceramics, printmaking, or (metal) sculpture. Visitors donning white peruse the beautiful creations comprising our front gallery. Midsummer White Linen Night Midsummer demarcates resumption of the New Orleans School of Glassworks & Printmaking Studio's regular educational programming. Use this first of nights to enroll for any of our classes resuming this fall, whether a 30-Minute Mini-Workshop, 2-Hour Short Course, or 4–6-week Extended Course, open to adults and young adults alike. To preview our preliminary Class Schedule, please visit our pertinent page. The Crepe Cart will be in front of our gallery, selling their coveted selection of handmade crepes! These sweet and savory treats are certain to animate your palate! For more information, whether for our Young Adults Summer Workshop, classes resuming this fall, please do not hesitate to inquiry with our offices. Images compliments of Paul Douglas. All rights reserved. Sign up to stay abreast of new workshops, events, and announcements. Unsubscribe any time. © 2015 New Orleans School of Glassworks, Inc. All rights reserved.